You've probably heard I picked up my sister and two friends at the Fort Lauderdale airport yesterday. What I didn't tell you is that since they all came on separate flights to different terminals, and then had to collect baggage and find each other before a pickup, I had an extremely short window to hit the nearby Total Wine in Fort Lauderdale. I had been there once before on a similar pre-airport-pickup mission. Walked in with 10 minutes to spare, went right to the beer section. Guess who was there? Our leader Assistant Manager Ed pouring some snobby wines for some old dude. But those were lightning observations, and I could be wrong. LOL. Ed needed to work so I found myself one of the Southern Tier bottles that didn't make it to my Pembroke Pines store, like the idiot relative that can't follow directions to your annual party. Jeez. On the way out, Ed handed me a pretty cool glass that was an "extra" from some promotion. Cool. Smooth airport pickup. One of the first questions sister and friends asked was about the alcohol status at my house. "Yuengling" pretty much made the girl from Denver giddy. Yes, she is clueless (about the beer in her backyard, because she is actually very smart)! Funny. 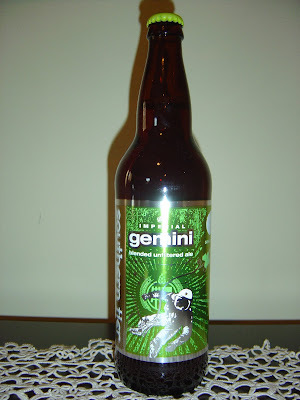 This afternoon I'm drinking Gemini, an Imperial IPA brewed by Southern Tier Brewing Company in Lakewood, New York. This will be the first Southern Tier beer I've tried after my quest from the other night. The label is really cool. I think more breweries should invest in this aspect of their beers. Of course if you want repeat customers you've gotta brew good beer, but this bottle stands out and screams "try me!" Electric green and silver colors with big bold white lettering, kind of reminds me of those foil collecting cards kids have. There is an astronaut on the front, and the back goes to great efforts to explain the Gemini Constellation and how Southern Tier has their own fraternal twins: Hoppe and Unearthly. This beer constitutes a 50:50 blend of those two beers. Mission (yes, the theme is getting a little much): "to travel high & take passengers on a journey far into the heavens!" Also cool--the ingredients are listed on the bottle, and they recommend serving this at 42 degrees F, which is pretty cold. Nice citrus aroma with loads of grapefruit, lemon and orange. Flavors start out similarly, with pine and citrus flavors. Very much on the sweet side. Candy, caramel, sweet tropical pineapple and tangerine flavors are very nice. The texture is viscous, providing a sticky and oily feeling in my mouth. The 10.5% alcohol will not be missed, especially after the initial flavors subside, and especially after the beer warms slightly and you progress through big 22. You will feel a slight burn, taste some flavors that will you remind you or your organic chemistry classes, and finish with a drying alcohol flavor on your palate. Carbonation is perfect, with fine creamy bubbles. Now, I would have preferred a more refreshing beer, but this was very flavorful and quite awesome. I am delighted this was the first Southern Tier beer I chose to drink. So go get yourself some of this! Yes, once again, my photography should be displayed at the best galleries! Seriously, though, you can't really see the neon aspect from the picture. So use your imaginations! This is the best of the Southern Tier beers that I have had so far that just arrived. I agree the label is awesome! They doing a great job telling a story and give stats on the bottle. Kind of a cross between Stone and Rogue. I thought 42 degrees was too cold. I don't agree with them on that. Drink this one fresh. I had it New Years eve so that one was close to a year old and it was not as good. Hey Ed. Good seeing you (briefly) last night. So you're telling me the other 9 I bought from you guys are going to be downhill from here? Neither Boynton or Boca got Gemini but I might try mixing Unearthly and Hoppe when I have them to just see how it is since that is technically what Gemini is right? Yes, the bottle says 50:50. Just open your mouth and start pouring both bottles at the same rate. LOL. I've dreamed of making Black and Tans that way! 1st of all Ed never comments on my blog...I feel left out. 2nd I cant wait to open this bottle. Finally everything I have had so far from Southern Tier has been solid! Ed has made a few comments. Usually he was mentioned specifically in the posting. Or in others, he's had a nickname. I'm looking forward to the others from Southern Tier, too. I positively loved Gemini - we just finished a pony keg of it here. It was extremely hoppy yet somehow wicked smooth, and the smell of peaches was heavenly. Cheers! Nice to "see" you. This has been my favorite so far from Southern Tier. I do have the Choklat at home waiting for a special occasion, though. Yes, those fruity flavors and the aroma, wonderful. Beer Drinker - When you do enjoy the Choklat, know that it's like fermented Hershey's syrup. Very tasty but damn, it's the most choclaty beer I've ever had. I hope to head to Southern Tier in a week or two since I have yet to tour their brewery. I really dig most of their brews. Have you had any of the Cuvée beers yet? #2 is delicious. I am really looking forward to Choklat. I've just been pacing myself LOL. Let me know how the brewery tour goes and no, I haven't had any Cuvee beers. I actually had to go online to see what it is. Another Southern Tier beer, I see. We don't have that one down here in Florida. BTW, if you ever want to do a guest post/review here, let me know. You've probably noticed it's beer + whatever else you feel like talking about! Also, if ever you want to do a beer swap, let me know! I could send you some lovelies from around here - USA Beer Trends (out of TX) and I just swapped and I received some delicious brews I'd never get my hands on if we hadn't - so rad! Sent him a Cuvée too.